I admit it. I am in the bag for Virgin America. I have been since before they took off. (Literally.) I once live tweeted a flight to San Diego using their in-flight WiFi. Savvy travelers will recognize that the picture at right was taken on a Virgin flight. Groupon: $7 for $77 off travel to/from Chicago. Groupon: $25 for $100 off travel from Dallas. Groupon: $25 for $100 off travel to/from Chicago. Loopt: $35 for $100 off travel from San Francisco. All of these deals sold out. All 500 of today’s Loopt u-Deals sold out in less than an hour. 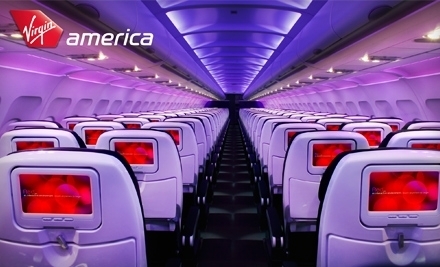 So why do I think that Virgin America’s daily deal marketing is brilliant when I think they are bad for many businesses? Economics, plane and simple. Lock in on new routes. Whenever a carrier like Virgin launches in a new market, legacy carriers will dump extra capacity onto the route to keep their share and make life harder for the new guy. By having people pre-purchase these vouchers, it creates a powerful reason to try Virgin instead. Higher purchase price. Although the deal price may be effectively 65% to 75% off the voucher value, you have to spend a lot more to use it. A SFO-LAX roundtrip on Virgin will cost you $158 plus taxes. The Loopt voucher saves you 40% at best. On a SFO-IAD flight, the savings drop below 20%. Virgin sometimes gives away 20% off vouchers, so this isn’t that much different from their regular marketing. A lot of restrictions. As with many travel deals, Virgin’s daily deals come with a lot of restrictions. You can’t use them on First Class, Main Cabin Select or refundable fares. You can’t use them during the peak of summer demand. The restrictions on the Loopt deal are longer than this blog post. All of these serve to reduce cannibalization and try to drive incremental traffic. Caps and cheap publicity. The deals are capped at relatively low numbers, but generate a fair amount of press coverage. This is especially important on new routes. This entry was posted in advertising, airlines, groupon, local search. Bookmark the permalink. Yes Virgin is totally responsible for in-flight Internet – and I’m thankful for it! I mean, what took so long? I’m impressed with your site. I had no trouble navigating through all the tabs and information was very easy to access. I found what I wanted in no time at all. Pretty awesome. Would appreciate it if you add forums or something, it would be a perfect way for your clients to interact.